Vinoteca Marylebone is the sister restaurant of the original Vinoteca wine bar and restaurant in Farringdon. It opened in November last year, but unlike Brawn, the sister restaurant of that other well known wine bar, Terroirs, it has barely registered on the Richter Scale of restaurant openings. I found out about it purely by chance. Thinking I would go to the branch in Farringdon, I stumbled across the details of the Marylebone branch when I went onto the Vinoteca website. Despite the lack of PR fanfare, the restaurant is already doing a thumping trade. It was packed during our visit and justifiable so. Its concept is simple – good, seasonal food, in an ever changing menu, matched with one of the 25 wines that are available by the glass. There are also 280 reasonably priced bottles to choose from. Vinoteca Marylebone is cosy and intimate. It does not take reservations, but there’s a bar area to drink at while you wait. Due to the lack of carpeting and rugs on the floor, its only drawback was that it was incredibly noisy which made conversation a little difficult. But this can also be construed as fantastically atmospheric. 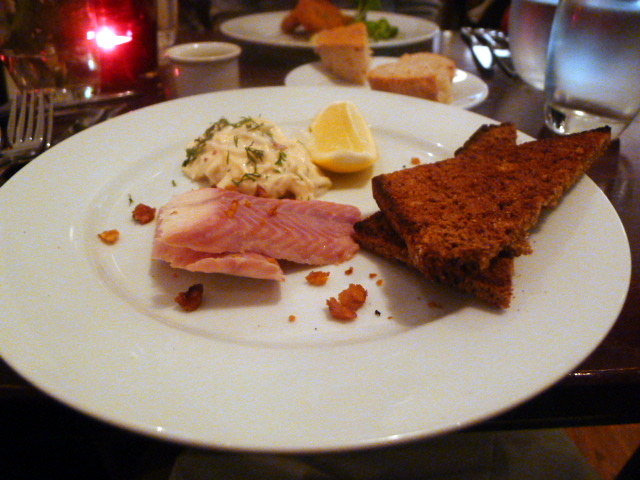 We started with a heavenly smoked eel with celeriac and apple remoulade and wheaten toast (£8). The eel was delicate, succulent and lightly smoked, and the creaminess of the deftly made remoulade was a perfect match. There was a hint of sweetness in the well-made, flavoursome bread which made this dish all the more appetising. The suggested wine, an Austrian 2009 Kamptal Gruner Veltliner ‘Kies’, Kurt Angerer (£4.50 for 125ml) was a great accompaniment. Crubeens (£6), a dish of pigs’ trotters marinated in mustard, deboned, rolled, crumbed and deep-fried, provided a lovely contrast between the crunchiness of the crumbs and the soft gooey trotter. It came with a gribiche sauce which is similar to a tartare. The tanginess of the sauce added a touch of zing to the crubeens. This dish was also very enjoyable. 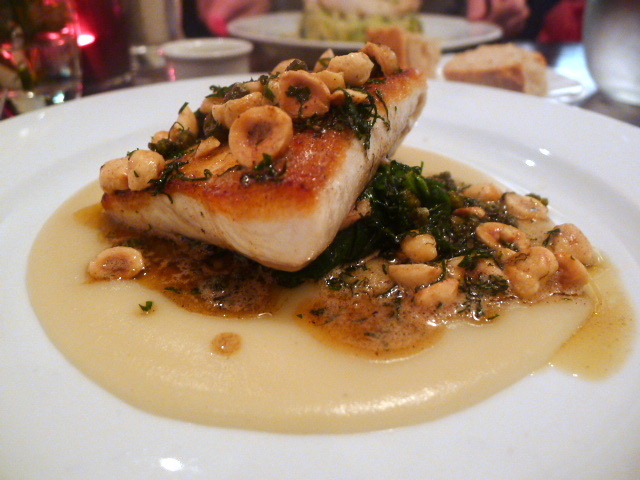 A main of Scottish halibut (£15.50) was accompanied by a Jerusalem artichoke purée, capers and hazelnuts, and finished with a fantastic beurre noisette. The purée, with its delicately creamy and nutty flavour, was wonderful. And the flavour combination of all the ingredients was explosively tasty. I only wished for the hazelnuts to have been chopped a little smaller for easier eating, rather than left whole, and the halibut to have been a little less cooked. 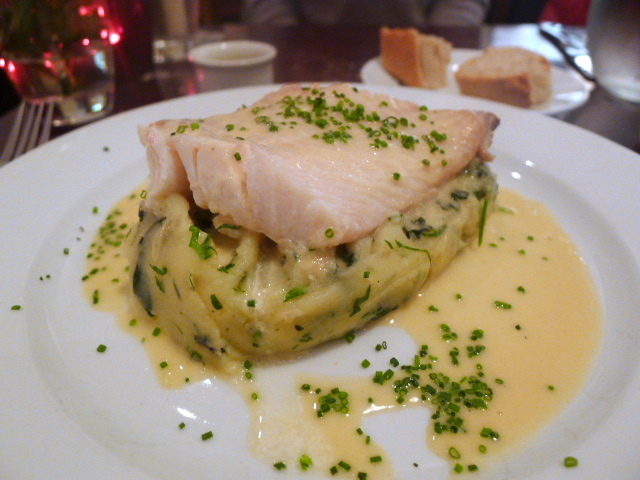 A smoked haddock, with colcannon and mustard cream (£12.50) showcased a succulent piece of lightly smoked fish, and a colcannon which was creamy and tangy from the mustard cream. This dish was expertly produced. 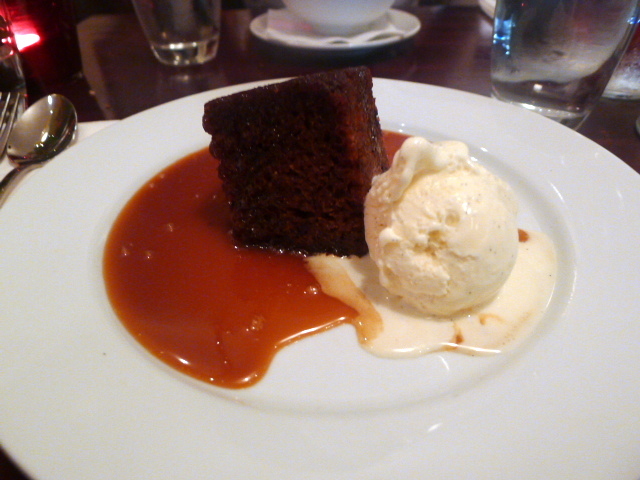 A sticky toffee pudding with vanilla ice cream (£5.50) was decadent and delicious. It was finished with a generous portion of toffee sauce which was rich and satisfying. We opted for the hazelnut and ginger flavours from the ice cream selection (£4.50 for three scoops). The stem ginger in the latter danced a nice little jiggy on my tongue. Vinoteca Marylebone is fantastic. The food is great, there’s an ample wine list, the ambience is buzzy (even if it is a little noisy), the décor is warm and the service is polished. And best of all, the prices are very reasonable. I am as excited about this place as I was when Terroirs first opened. I can’t wait to go again. What a great addition to the London dining scene. Price range: £20 – £30 a head. Excludes drinks and service. 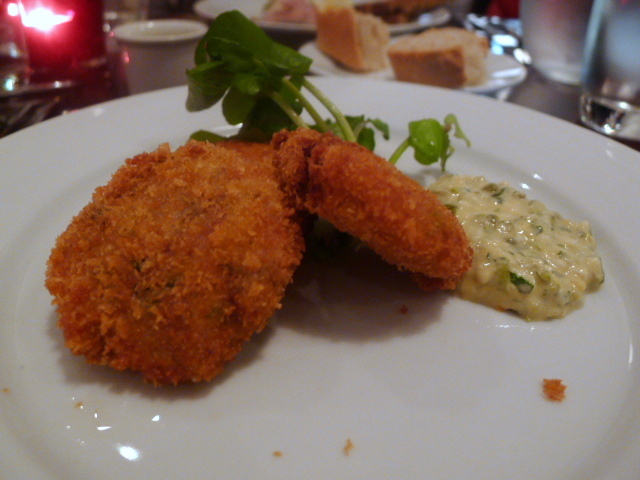 Check out Gourmet Chick’s review of the original Vinoteca in Farringdon. Great timing on this review. I was planning on going tonight, now looking forward to it even more! The place got well reviewed in the Metro this week, so I’m expecting it to be pretty busy. Am desperate to go here as I love the original Vinoteca so much. The food looks fantastic. I agree that Brawn has got a lot more press – I think Marina O’Loughlin said the same thing in her review of Vinoteca in Metro yesterday. Thanks for the link as well! I love the mothership in Farringdon, and so am very eager to give this new branch a go. If it even comes close, then it’ll be a welcome addition to Marylebone. I love the mix of informal drinking and good, relatively simple food. It’s a great concept and perfect for a friendly dinner. The food looks like it is pretty much up to scratch as well. A friend of mine and I was talking about Brawn on the w/e – yet to go. But can’t believe hardly anyone has talked about Vinoteca. And you’re welcome on the link. I haven’t been to the mothership but if the Marylebone is anything to go by, I have no doubt Farringdon is just as good. Am a big fan of the Farringdon Vinoteca so was very excited to read this post. Sounds great. Shame neither branch takes bookings (though totally understand why) – it’s just that sometimes I don’t want to turn up on spec & hang round for a table …..